This calculator is huge. The keyboard is nice and large. The keys are large, that you can easily rapidly type calculations. 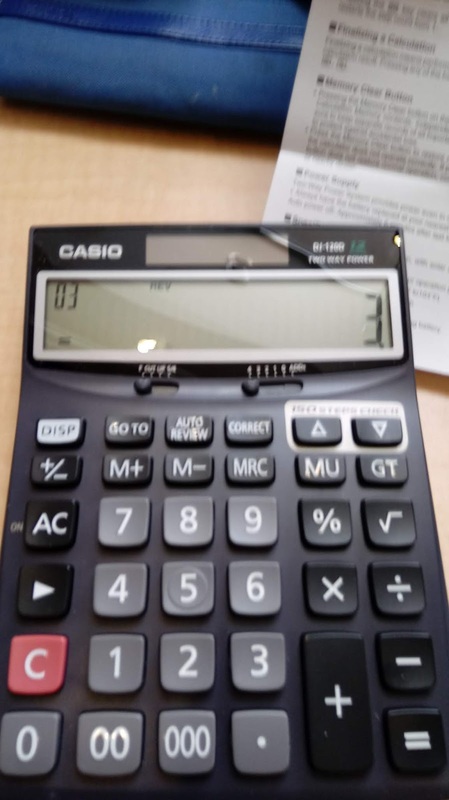 The screen is also large, making the numbers the screen easy to read. The keyboard has a double zero (  ) and a a triple zero (  ) key, you can enter large numbers rapidly. There are many display options, primarily by two switches. One switch sets the number of decimal points (0 through 4 and add mode). The other switch determines how numbers are rounded (float (not at all), cut (truncated), up (round up), and 5/4 (regular rounding)). You can set additional displays modes, such as comma or decimal point for fractional marks using the [ AC ]/[DISP] key and scrolling through the options. You actually make two settings. Those two settings get toggled with the [DISP] key in regular calculator mode. Add mode allows numbers to be added and subtracted in "dollars and cents" (divided by 100). The automatic division by 100 is not affected by multiplication and division. Add Mode is activated when the rounding mode is set to either cut, up, or 5/4. The DJ-120D has a 150 step memory. All the arithmetic calculations are stored in each step. Historical calculations are finalized by either pressing the equals sign [ = ] or the percent sign [ % ]. Calculations can be reviewed by using the arrow keys, the [GO TO] key, or the [AUTO REVIEW] key. When you are using the review feature, the display may not be intuitive. For the arithmetic and percent sign, the function is read on the top of screen. When you conclude a calculation, the display will show the equals sign on the left side of the screen. This takes getting used to. Note how the equals sign is on the left, not on the right. It may be confusing to read at first. Also, square root operations affects only the number in history, the square root function is not recorded as a step. While editing operations, you can correct steps. For example, I change the first step to 1210 +. The DJ-120D has a Grand Total feature. This accumulates every calculation that is completed by pressing the equals key. You can recall the grand total by pressing [ GT ]. 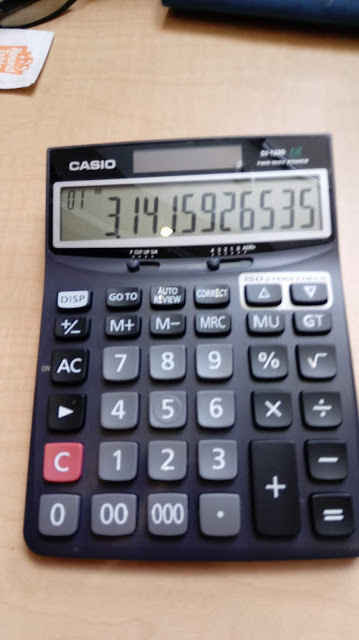 The grand total is a separate memory register. The all clear key [AC] (also ON) clears both the grand total and history. The markup key [MU] performs the operation x/(1 - p%). I love the large keyboard and the display. I would recommend this calculator for students who are learning math (the review function makes it useful to review math calculations), and office professionals. All original content copyright, © 2011-2019. Edward Shore. Unauthorized use and/or unauthorized distribution for commercial purposes without express and written permission from the author is strictly prohibited. This blog entry may be distributed for noncommercial purposes, provided that full credit is given to the author. Please contact the author if you have questions.